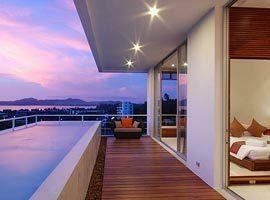 This stunning and rather exclusive area is located between Bangtao and Kamala Beach, approximately 20 minutes from Patong. 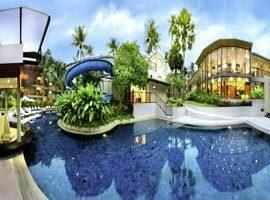 Due to hotels in Surin Beach Phuket being the deluxe 5 star type including names like the fabulous TwinPalms and The Surin Resort which is located in an intimate cove called Pansea Bay, it has earned the reputation of the island's millionaires row. Though popular it is never too busy, always relaxed and while it is pretty much devoid of serious nightlife and noisy crowds you are within moments of Patong and quaint Kamala Village. It's own town is reminiscent of a little coastal village and the beautiful beach is fluffy white. 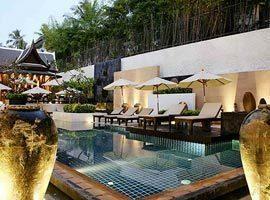 Its high-end hotel accommodation has given rise to some fine restaurants and wine bars in the area. 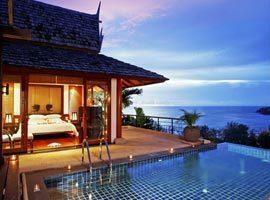 The popular Manathai and Surintra are 2 stylish boutique resorts with direct beach access offering more moderate prices. This luxury boutique resort settles comfortably amid lush vegetation on the slope of a hill to allow jaw dropping ocean views from each of its Thai designed suites. The beach is within easy walking distance. Ideal for couples and families moments from entertainment and nightlife. It features a beach club, a kids club and a pool with water slide. Deluxe pool terrace rooms and suites allow direct pool access. Set amid aromatic lotus ponds and allowing direct beach access.it offers 4 star accommodation decorated in northern Lanna style. 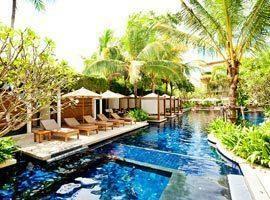 Offers rooms right next to the pool and suites with private plunge pools. For the ideal family accommodation Surin Park offers 1, 2 and 3 bedroom serviced apartments featuring the conveniences of a hotel and the comforts of home like equipped kitchens and living areas. 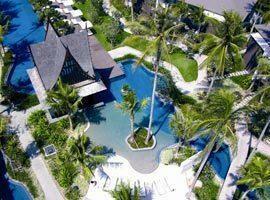 Surintra is a chic and stylish boutique resort located 50 meters from the beach. 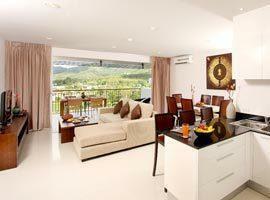 It offers expertly designed rooms featuring private balconies and jacuzzis. Enjoy 2 pools and free Wi-fi. Featuring 2 bedroom suites with full kitchens, modern entertainment systems and some with private plunge pools plus outdoor pools, restaurant and spa The Chava is the ultimate family friendly hotel. The Quarter is a modern and trendy collection of romantic suites featuring either private jacuzzis or private infinity edge pools with charming ocean views. All feature a luxury lounge and kitchenette. This 5 star beachfront hotel cascades down the slope of forest covered hill in Pansea Bay and offers romantic thatched roof cottages as well as 2 bedroom accommodation which sleeps 4 persons. Chic sophistication combines with idyllic nature in one and 2 bedroom suites, rooms with direct access to an exclusive lagoon pool or you can choose a 2 or three bedroom penthouse with a private pool.